Yesterday we celebrated mother’s day. It was a fabulous day with Mr. Bingles and my three children. We spent the whole Sunday together, in the morning we had a fantastic breakfast in a Greek coffee, I love this place (www.oakleighqualitycakes.com.au) not only because you can have great cakes but also because you feel like in Greece, not only people speak Greek to you but also the atmosphere reminds me of Greece. After breakfast we went to the beach, it was relaxing for me and fun for the kids. Later in the afternoon I went “leaf hunting” with little Miss Fussy and little Miss Daydream. while walking about we sang “we are going on a leaf hunt, we are going to catch colourful ones, what a beautiful day, we are not scared!” (remake of the book “we are going on a bear hunt). It was lots of fun picking up autumn leaves from different kind of trees, then at home we took one leaf at the time, put it under a piece of paper and with a crayon we coloured the paper so that you can see the shape of the leaf underneath together with all the details. Finally we cut all the colourful leaves out and we stuck them on the kid’s wardrobe. 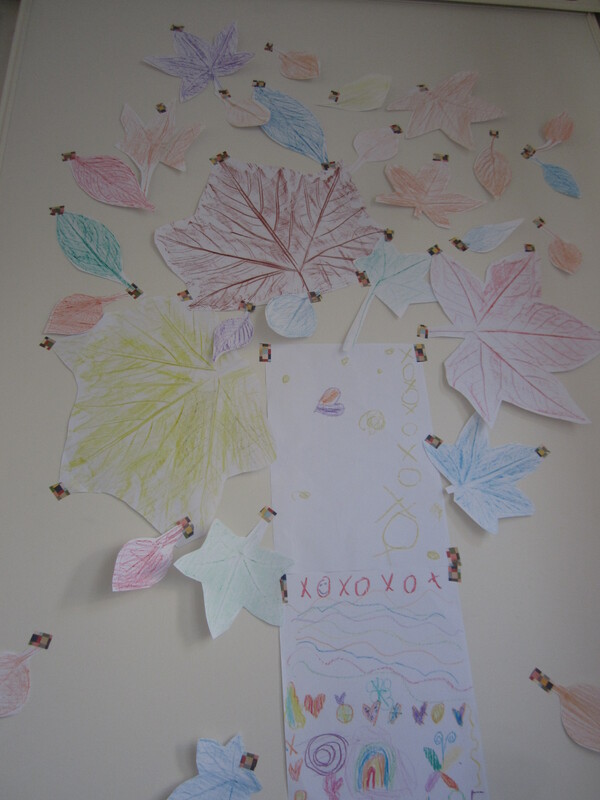 It’s been lots of fun for all of us and the kids have learnt about leaves shapes and colours in autumn.